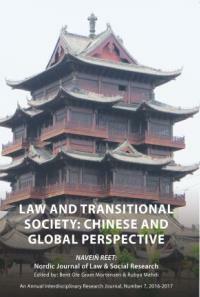 Chinese Contributions to Global Normative Pluralism? NAVEIÑ REET: Nordic Journal of Law and Social Research (NNJLSR) is a peer reviewed annual research journal. NNJLSR aims to publish original and innovative legal scholarship in the diverse fields of law. NNJLSR is keen to publish interdisciplinary socio-legal research that examines the interface between law and political science, economics, sociology, philosophy, anthropology, ecology, feminism and legal institutions. The journal further aims to share research and ideas about legal matters of concern which are common to developing countries; to encourage research in these fields; and to build conventions of academic discourse and publication. The journal encourages work which sees law in a broader sense, and so sees legal matters as including cultural diversity and plural legal realities all over the world. Moreover, the journal aims to function as a platform for communication on legal matters of concern among the powerless and those who struggle to access justice. The journal welcomes contributions from judges, lawyers, academics and law students. In addition, given its policy of encouraging interdisciplinary scholarship, it welcomes input from specialists belonging to other disciplines. Contributors are welcome to address issues from national, comparative and international perspectives.